There may be no television property more ripe for a video game adaptation than Adventure Time. A lot of its stories are, by the creator’s admission, structured like mini-Dungeons & Dragons campaigns. It’s easy to imagine throwing the huge list of characters and the shockingly well-defined world they inhabit into an RPG, getting the writers to cook up anywhere from 20-40 hours of endearing plot, and finding a developer who could design a satisfyingly simple combat mechanic. Paper Mario comes to mind. Adventure Time: Explore The Dungeon Because I DON’T KNOW! (henceforth referred to as Explore The Dungeon) is not that game. I love Adventure Time with a passion I normally reserve for thunderstorms, and a particular pizza sandwich I can buy at the local sub shop. It’s beautifully animated, sharply written, and stealthily depressing. It also manages to be incredibly sentimental while never especially pandering or saccharine. So clearly my relationship with this property is what a lot of people like to call “biased,” (as if bias is avoidable in a review, but whatever) and as such I’d recommend the ensuing review be colored by that information. I mention this up front because I like Explore The Dungeon, despite a lot of very compelling reasons not to. The biggest draw for fans of the show will probably be the involvement of creator Pendleton Ward, who helped pen (heh heh) the game’s admittedly bare script and oversaw its development. The result is perhaps the game’s most noticeable blessing and curse: the depth of reference is so delightfully precise that I have a hard time imagining any newcomers keeping up. I, for instance, am familiar with the lonely Ice King’s “Fionna and Cake” fan fiction, as well as the origins of irate monstrosity Lemongrab, or the complicated late-season romance between Flame Princess and Finn the Human. Explore The Dungeon spends exactly zero minutes explaining quite literally any of these dynamics, making the whole affair for super-fans only. Or casual fans, I suppose. Though even they might not fully appreciate the charms of Princess Bubblegum collecting candy taxes, or some loading screen quotes from Jay T. Doggzone. I’m torn, because as a self-described super-fan, I appreciate how little time is spent reiterating what I already know. But if I’m to judge Explore The Dungeon as a standalone product (as I should), its outright refusal to justify itself is more damaging than beneficial. The “huge reveal” that Ward touted at the game’s conclusion is pretty significant, but only with the context of the show backing it. Otherwise, I’d imagine the whole thing would land with a thud. If, on the other hand, you share my proclivities, there’s a surprising attention to detail. The story, in all fairness, is a pretty insignificant portion of the total experience. True to its name, you will spend most of your time exploring Princess Bubblegum’s Secret Royal Dungeon because she doesn’t know what’s going wrong. Prisoners are escaping with alarming frequency, so it’s up to Finn, Jake the shape-shifting dog, and a host of other characters to solve the mystery. Explore The Dungeon is clearly taking a lot of gameplay cues from Gauntlet and Diablo, but comparing it directly to those games would be a silly approach. It’s a kind of simple, pared-down roguelike, if that genre descriptor has any meaning anymore. It also makes the smart decision of not confusing simplicity with difficulty, or lack thereof. Explore The Dungeon is at its very best when its punishingly difficult, and in two player co-op (I can’t speak to how the difficulty might scale), it frequently is. The roguelike elements are also most apparent in these segments, thanks to some basic but tense design decisions. In each dungeon run, you need to collect treasures to upgrade your character, but there are severe penalties along every step of that process. Dying nearly halves your take, and exiting the dungeon at a checkpoint means you can’t go back in with what you’ve already earned (candy taxes, remember?). It’s a device that’s been used to great effect in games like Rogue Legacy, and that base thrill remains intact. It forces you to make some tough decisions in the dungeon and out, about which risks to take and which stats to upgrade. The upgrade paths are all pretty simple, keeping in step with the rest of the game. Each character has a different meter-based “imagination” attack; Jake summons his girlfriend Lady Rainicorn to drop some health items, while the Ice King reads the aforementioned fan fiction to freeze enemies in their tracks. The meter can be upgraded and split into segments, opening up new effects and demanding smarter energy management. The biggest issues with Explore The Dungeon pack a pretty sour punch, and they all trace back to one unfortunate crime: repetition. There are 100 floors in the main game (plus an ultra-difficult “Nightosphere” dungeon I have yet to fully explore), and while they’re thankfully randomly generates, they’re all pretty similar. You get a checkpoint every five floors, a boss every ten, and a tileset change every twenty, which barely scrapes by as acceptable. Some of the easier, duller dungeons can be a bit of a slog, especially if you die unexpectedly and get sent back a couple floors. The enemy variety can also be pretty sparse, which is more excusable when their attack patterns are as distinct and challenging as they are in the late-game dungeons. Oh, and there could be more music. What’s there is pretty good, at least. Dig that bonus treasure stage tune. This grind is pretty much an implicit agreement between the player and the game if they choose to partake in something classified as a “dungeon crawler,” but there’s another area where Explore The Dungeon is extraordinarily deficient: multiplayer. In this day and age, corralling two or three friends to come over and play video games on the same console is more of an imposition than its ever been, which makes the game’s lack of online multiplayer a severe knock against it. It wouldn’t even be that big a deal if co-op weren’t so essential to the experience — playing this game single-player sounds like a real drag. But if you’re willing to put those issues aside, and if you’re as big an Adventure Time fan as I am, then there’s a decent amount of fun to be had here. In my 15 hours playing it, my mind would definitely start to wander, but it never quite crossed the line from basic to boring. It may very well do just that for you, especially if you aren’t desperate for more hot Land of Ooo action. And yeah, rope in a friend to play with you. 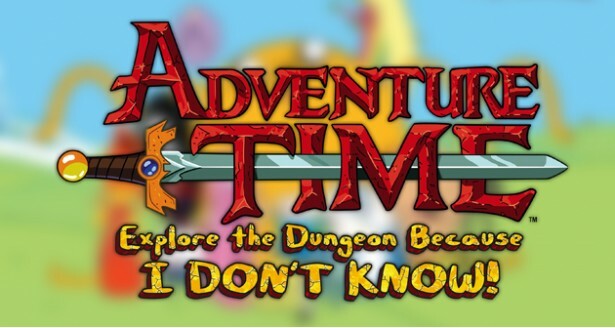 So no, Adventure Time: Explore The Dungeon Because I DON’T KNOW! is not a great game. Nor is it a great Adventure Time game. It lacks the scope and depth I’d like to see from a future title, one that takes full advantage of the show’s genius. The whole thing can actually feel a little like playing with action figures, but there are worse ways to spend a rainy afternoon, and almost none of those other options involve Starchy the Gravedigger. What else am I expected to do before the next episode airs?